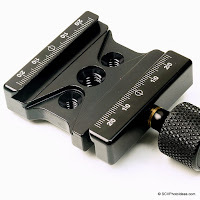 The Hejnar Photo F62A clamp is the successor of the Hejnar Photo F010A Quick Release Clamp which I have reviewed last month. The new design is now more distinctive making the clamp recognizable from other brands by the recesses in each side which serve both in lowering the clamp weigh and increasing its strength and by the new shape of its relief grooves. 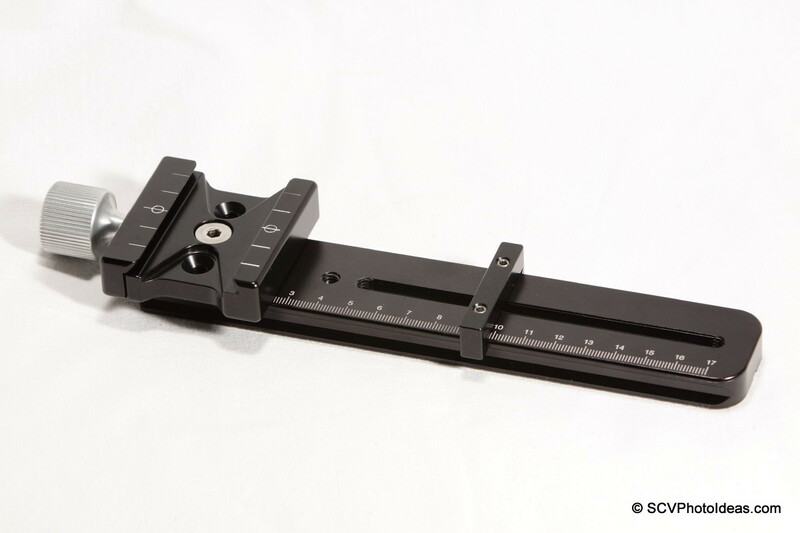 The major improvement that made me order this clamp are the deeper relief grooves that permit the use of Arca Swiss® compatible rails and plates from different manufacturers. 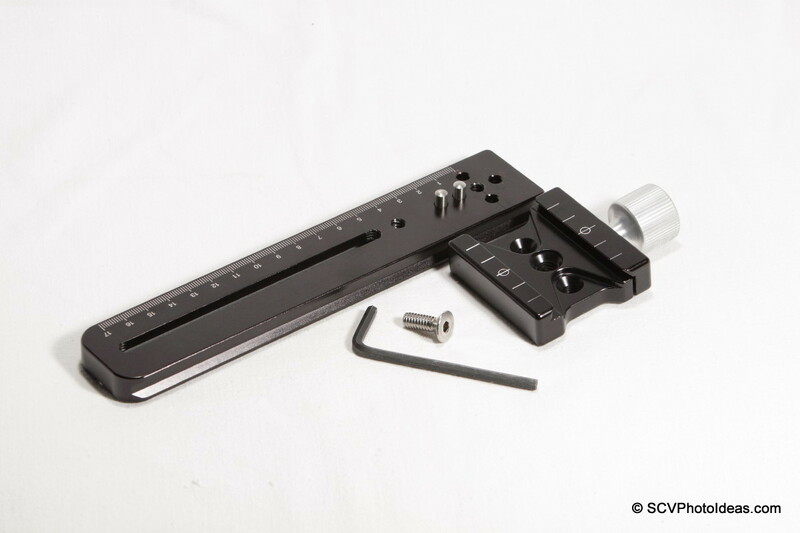 The F62A clamp comes in a padded package with one 1/4"-20 screw, ½" (1,27cm) long and one Allen Hex key. The A after all Fnn series model name stands for the short knob version. 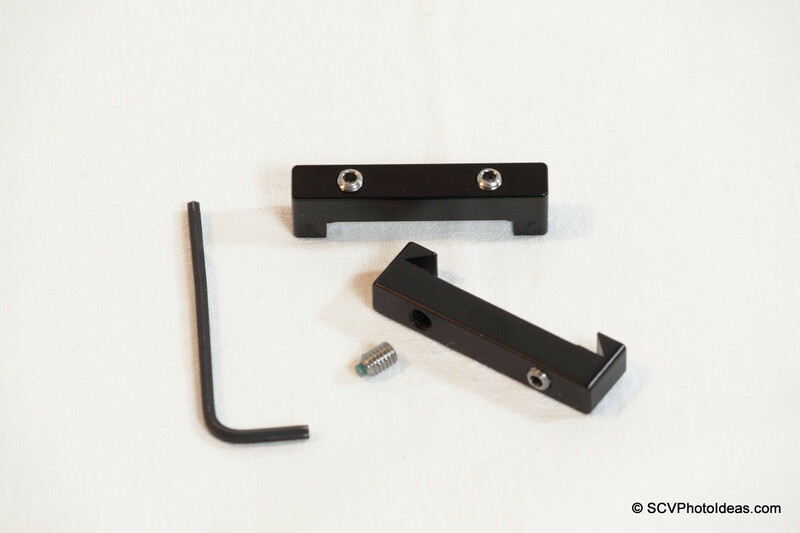 As all Hejnar Photo products it is machined from 6061-T6 Aluminium and is black hard coat anodized with a clear knob and weighs only 100 gr (3.53 oz). The center socket is countersunk on top but also threaded 3/8”-16. The two outside holes are taped 1/4"-20 and are 30mm apart from each other. 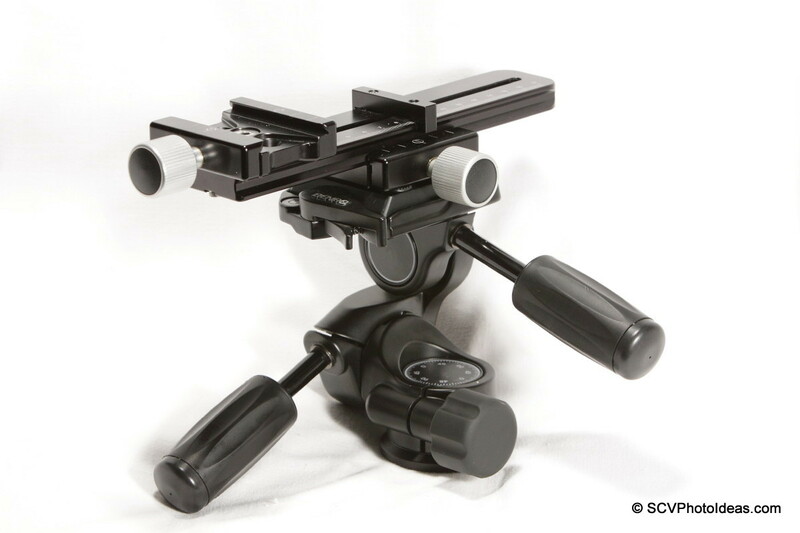 This makes it compatible with many ball heads, pan heads and gimbal heads. 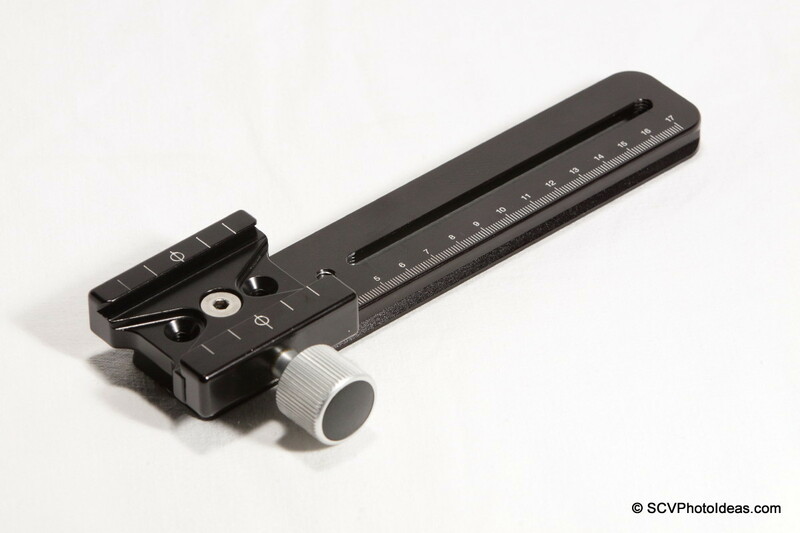 As the older F010A clamp it replaces, has 5 white index marks at 1cm intervals on each jaw, very useful for the alignment of rails and camera plates. 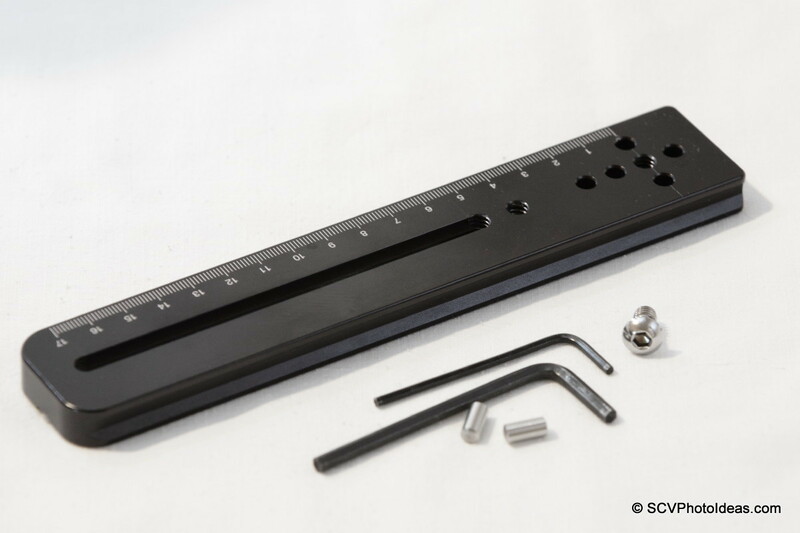 A signifiacant improvement comes with the deeper 2,67mm relief grooves, that also have a new shape, which make the clamps compatible with most if not all the brands of rails and plates with M3 safety stop screws which prevent from free fall in case the clamp is not closed. 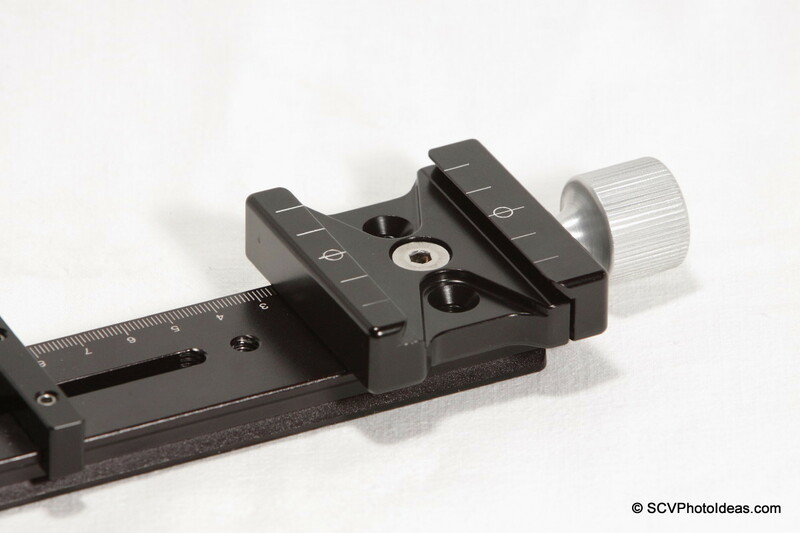 The relief grooves let a rail or a camera plate move 2cm further inside from the edge of the clamp in order to balance a long lens or center a camera. 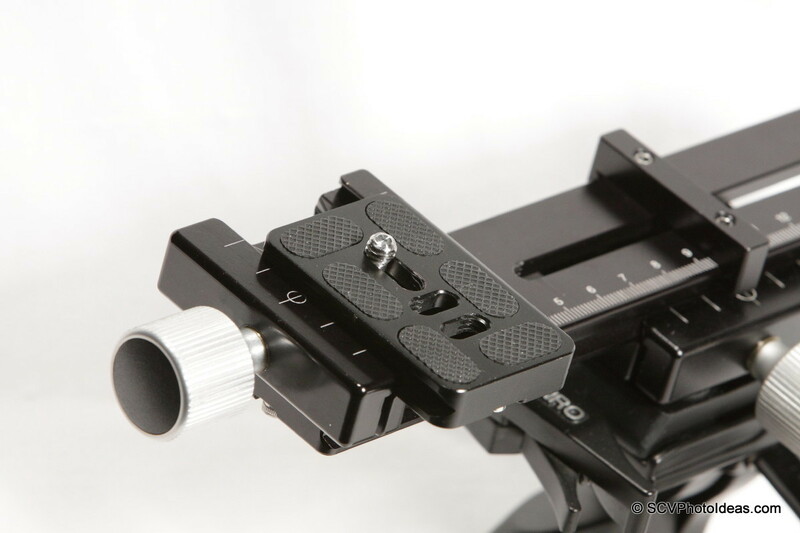 (More on that a little further down showing the clamp used on a macro rail, because it will permit an adequate side movement of the camera, depending of course on the type and size of camera plate). On the bottom (or back side) of the clamp we can see the usual groove vertical to the center socket, to match some ball heads connection notches preventing it from twisting as well as two extra dowel pin holes which are dedicated for the proper alignment, on the Hejnar Photo E03n series of rails or when someone would like to mount two clamps back to back. 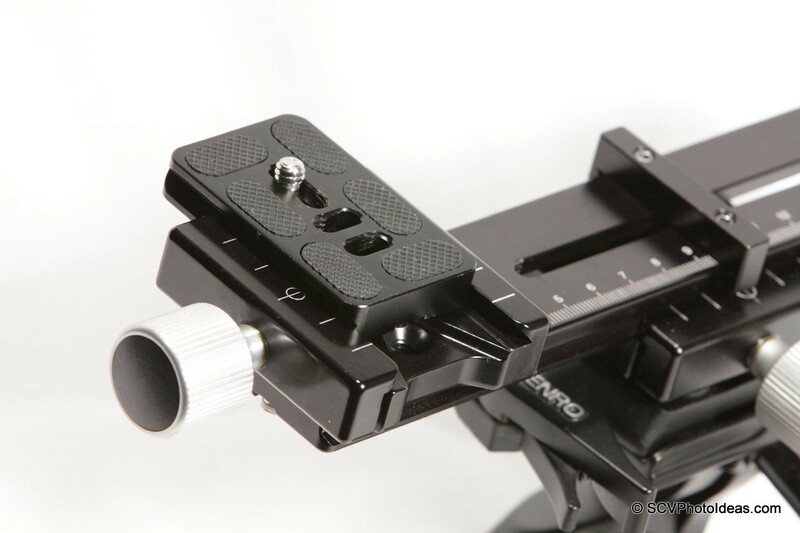 Here my choice is the Hejnar Photo E032 Nodal / Macro Rail to show the use of a Macro slide rail. (The rail comes with two dowel pins by default). 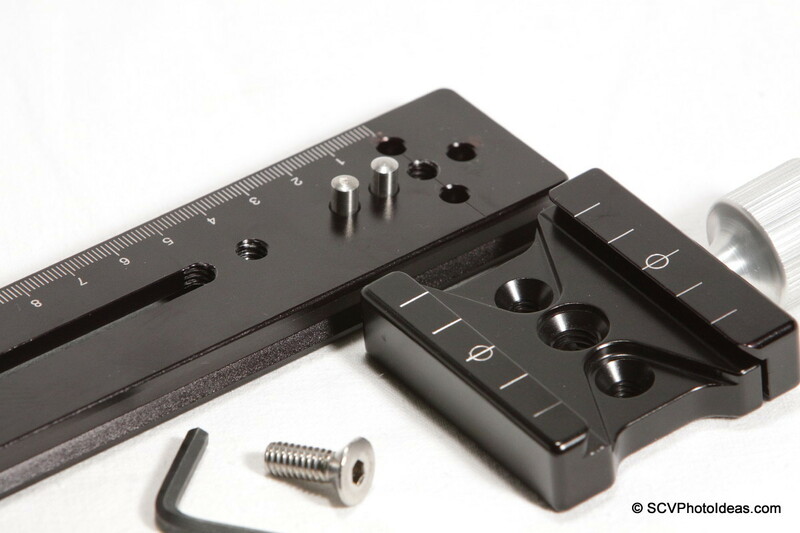 For use of the F62A clamp in perpendicular orientation to the rail axis, the two dowel pins have to be inserted in the two adjacent pin holes in front of the tapped 1/4"-20 thread hole of the rail. These holes comply with the two holes at the bottom of the F62 clamp. 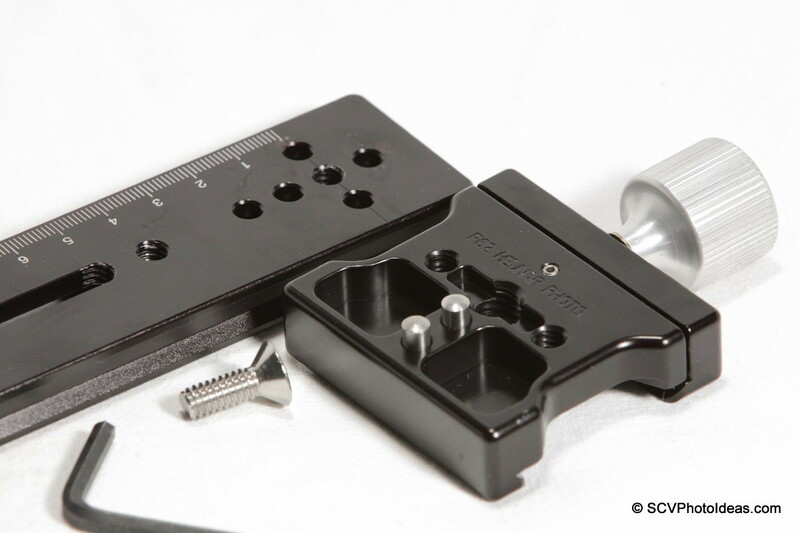 Then the clamp is fully aligned with the rail and can be screwed with the enclosed 1/4"-20 flash head screw. I find very useful the Hejnar Photo Index Bars which are equipped with two soft tipped screws and the appropriate Allen hex key. This proves a convenient solution for marking a point on the rail for future reference. Each bar is very light and will only add 9 gr ( 0.3 oz) to the total weigh. 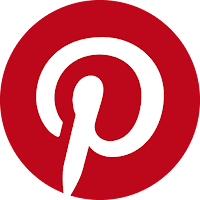 For use of the F62A clamp in parallel to the rail axis, only one dowel pin can be used inserted in a pin hole on either side of the tapped 1/4"-20 thread hole of the rail. This will match the pin hole closer to the center hole at the bottom of F62 clamp. 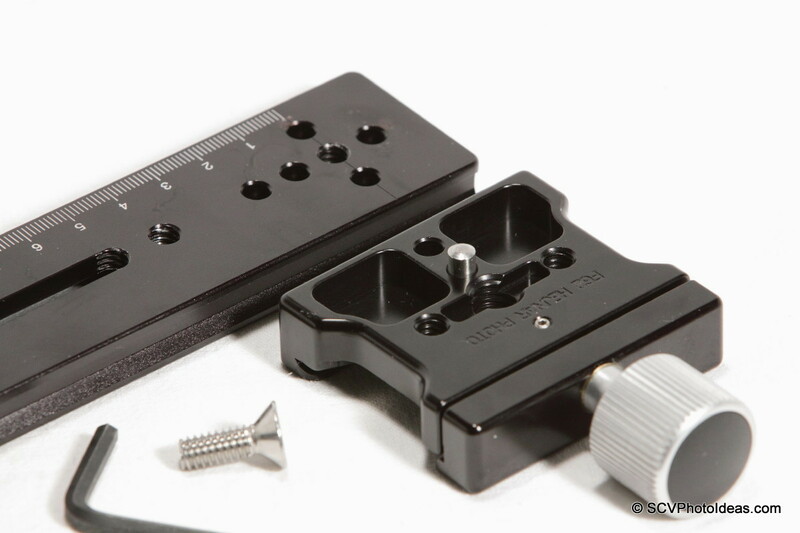 Once again the clamp is fully aligned with the rail and can be screwed with the enclosed 1/4"-20 flash head screw. Here the Hejnar Photo F62 clamp is screwed with an M6 screw on Triopo RS-3 Ball Head a great match to this small ball head's load capacity. 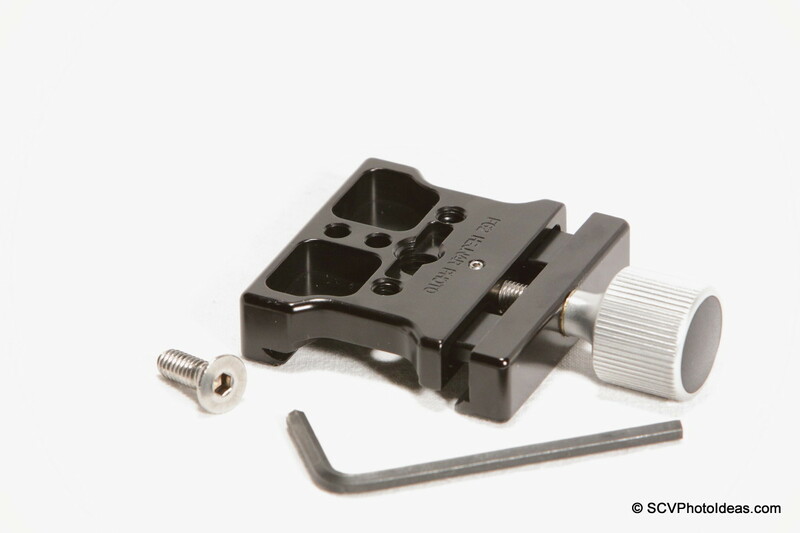 Having already attached an F010A clamp on the Benro HD-38 3-way head as described in my Hejnar Photo F010A and F012 Quick Release Clamps review, my base is ready for using the E032 rail combined with the F62A clamp as a macro slide. 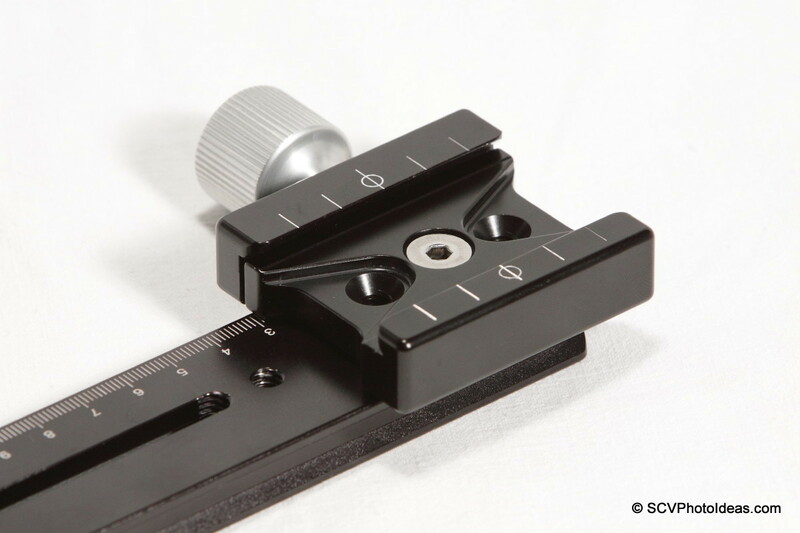 The Hejnaer Photo F010A 's ability for fine adjustment with the aid of its knob and the engraved index marks gives a nice solution in using and fine tuning a macro slide rail. By adding a camera plate, I want to show as mentioned earlier that the clamp's relief grooves let a movement further inside from the edge of the clamp. 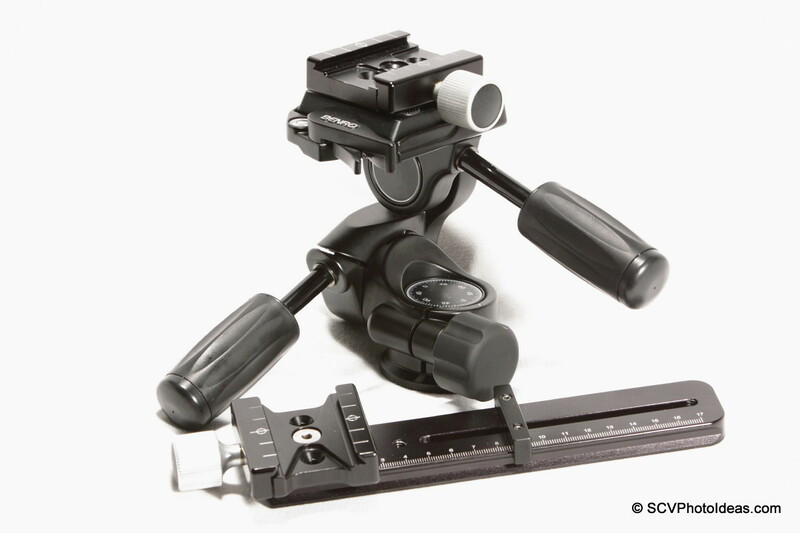 This can be very useful when shooting macro for fine tuning sideways. ...another 1,5cm to the right giving a total of 3cm which is fairly enough for fine tuning a macro shot. By using a longer camera plate this distance can be increased of course. 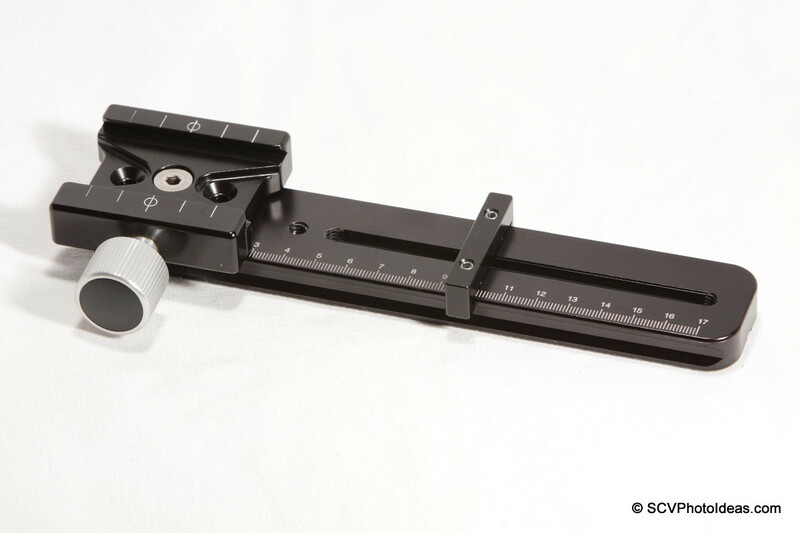 The F62A quick release clamp, besides the Hejnar PHOTO own rails, was also tested with various camera plates and lens plates, as well as with multipurpose long rails of various thicknesses and widths. 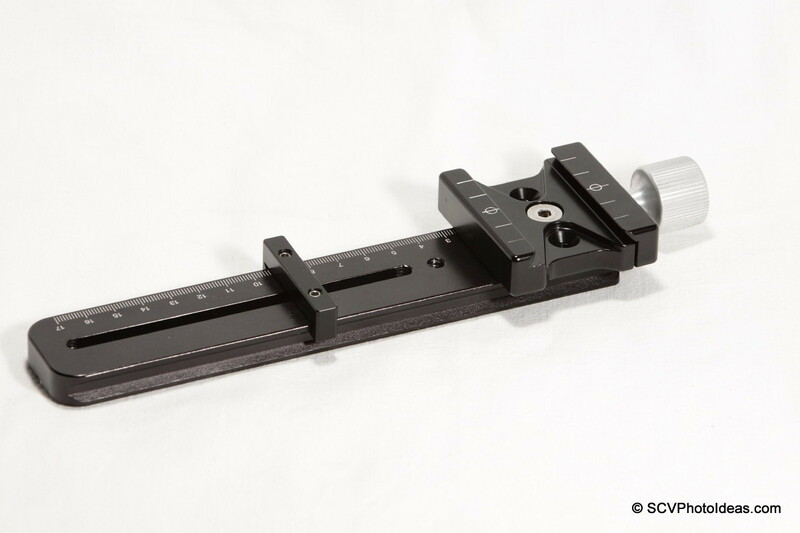 Plates / Rails tested were from Benro, Kiwi Fotos, Fotoporo, and Marumi with excellent results. 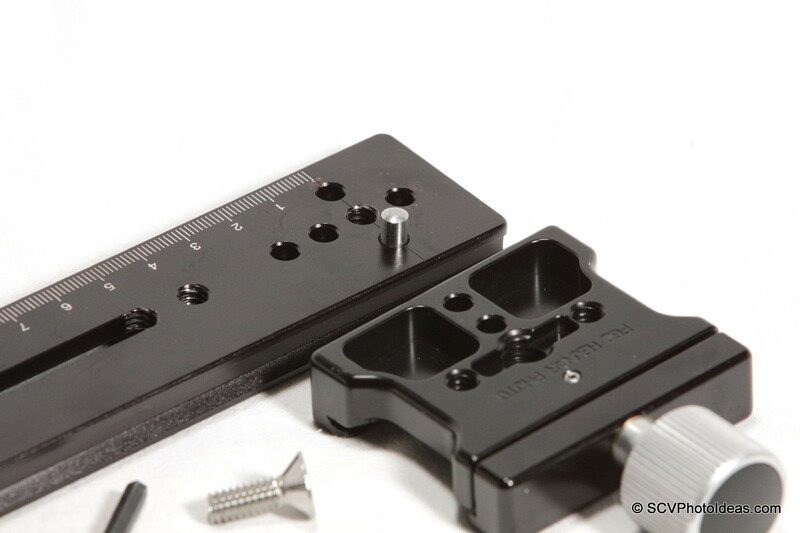 All dimensions fall within the average limits, consisting this clamp compatible with almost any Arca-Swiss® type plate and rail. Very nice sturdy and dirt-proof design. Very precise machining, very good finishing and anodizing. Excellent clamping strength with large clamping surfaces. 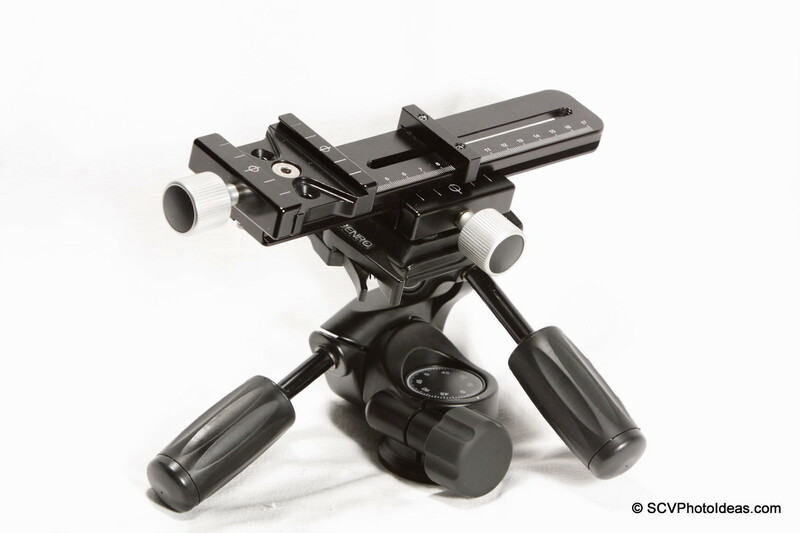 This is a very strong and sturdy QR clamp, with large clamping surfaces, designed to support heavy loads in any orientation very effectively, especially vertical panorama/gimbal head brackets which is a quite stressful task. 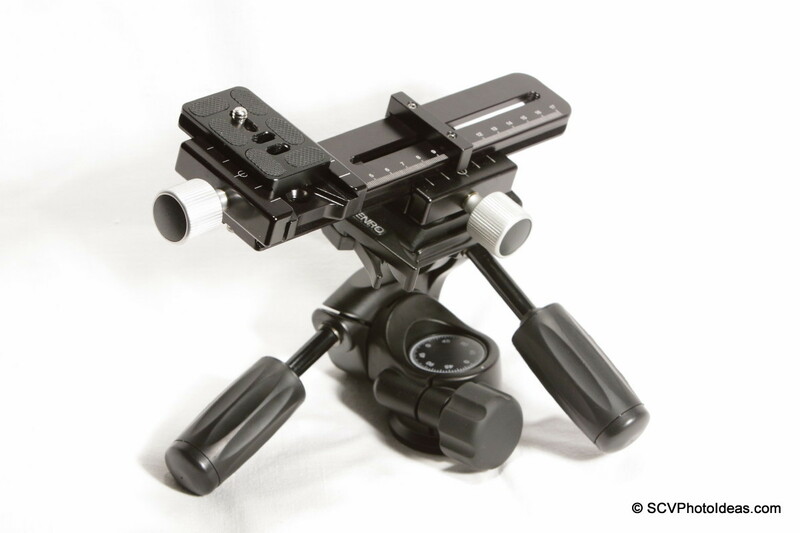 The extra mounting holes increase its versatility and mounting stability on many ball, pan or gimbal heads. Excellent work from a relatively small manufacturer. 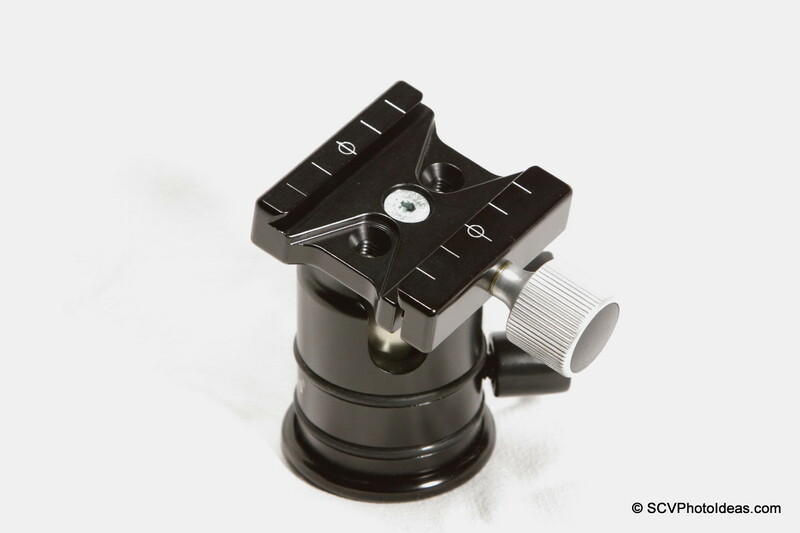 Current price for the F62A clamp is US$ 65.00 (+Shipping where applicable) and is available with long, short black or white screw knob, from Hejnar Photo Store. If you are interested in the clamp, do check the Recommended Sellers page for a valid Hejnar Photo discount coupon before placing your order. Hi, thanks for the great write-up with pics! 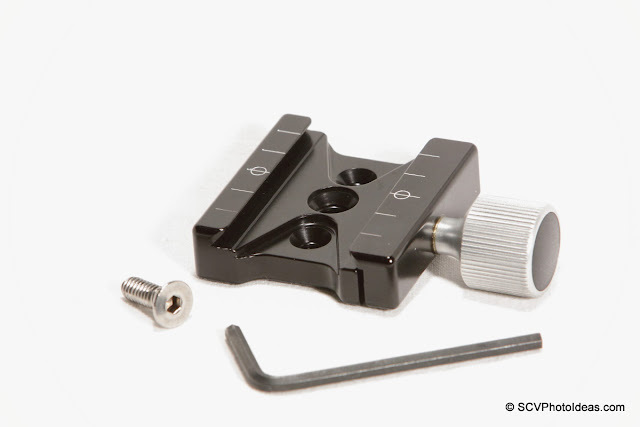 In vertical orientation, can the clamp be installed further down the rail, effectively making it a shorter rail (6.5") which can be used for ultra-wide-lenses, or do the holes not match up, or does the clamp knob get in the way of the rail? Hi Dan, thanks in return for your comment. You have got it right, the clamp knob will not permit the clamp be installed in vertical orientation further down,on the E32 8" rail. But there are solutions though, one is to use the shorter E31 (or updated E33)6.5" rail. However, even a 6.5" rail might prove long and show up in the frame with some ultra wide lenses. where by attaching an F012 clamp under F010 or F62 clamps will permit them to go further down and also elevate them. 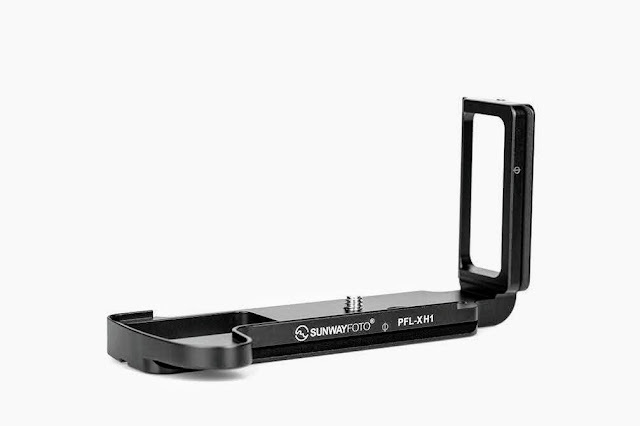 In this case you can have one rail compatible with a range of lenses, from telephoto to ultra wide.